Today's a little wish list, do you ever find yourself lusting over things on the internet? I've been doing this constantly recently, maybe because I have a little lady on the way and there are so many things I want to get for her, or maybe because I'm indecisive. I will look at something, look again, and then look again, I'm incapable of making an on the spot decision if I want something. We're currently living with my parents while things get sorted out with our future house, I'm not going to lie, it is so stressful. What makes it worse is our stuff is scattered all over the place, I have boxes in my Nan's spare bedroom, stuff in my Grandmothers loft, My bedroom is full of boxes, as is Sam's bedroom at his mums. I've been buying bits and bobs as we've been going along, for example, I have already purchased most of the furniture for Baby E's bedroom. That may seem like it's a bit soon, but it honestly has been so much easier buying it over a longer period of time, than all at once when the house is sorted (Also because I'm rubbish at saving). These are the final little bits and bobs I need/want. The lamp shade is part of the series Little lanes, from Mothercare. I have looked and looked for a play mat that I liked, and for me, it has to be this one. I love the way the petals of the flower provide extra padding. It's also really girly! I think this is a must-have for Baby E's bedroom, it's so tough making sure you keep tabs on the temperature. 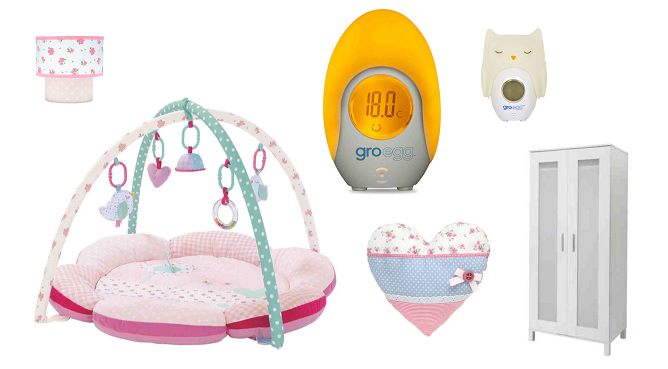 I love the little shell for the Gro-egg, I think without Orla it would look a bit plain. This is just to sit in her cot, more of a little finishing touch if you like. I love how it matches the rest of the bedroom. 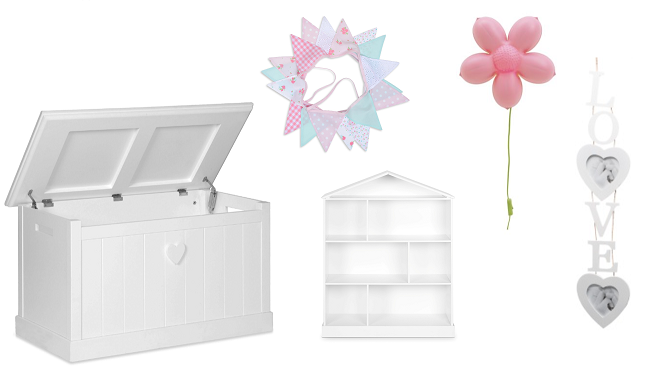 I didn't want to buy a wardrobe as part of a set with the cotbed, chest of draws/changing table and wardrobe, Simply because the wardrobes seem so much smaller than 'adult' size ones. I think it will be a waste because as she grows I will have to replace it sooner or later. Call it cutting corners if you like. These come in a set of two, To be really honest, they are more for me than her. I would like them to keep her memorable bits in for when she is order, things like the first outfit she wears, and her photo albums. I plan to use the bigger one of these as a washing basket, and the other to store odd bits and bobs. 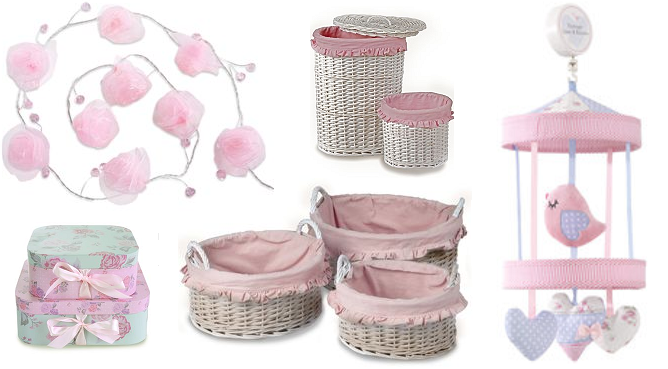 I want these to leave on the floor in her bedroom, to fill with her toys, books, and other little bits. That way its easy for her to access, but it is also kept neat and tidy. This has to be another one of my favourite items on this little wish list. I love the fact the mobile is a birdcage, I have never seen one like this before, and I think it will make a lovely addition to her bedroom. When I saw this I fell in love straight away, I always wanted one of these for myself when I was a small child, but I didn't have the room in my bedroom - However my brothers had one in theirs. I must admit I thought that was really unfair! I could probably make this bunting myself, however, I think it might be difficult finding the right fabrics. I'm going to have a little look around, but if not this is definitely my back up plan. I fell in love with this! How could you not? It is so adorable. What a bargain at £6. I love this little wall lamp, I saw it when I was in Ikea, and now I have a reason to get it, and with a place to put it. I love photography, you will already know this if you've read my blog before. So I think this little frame will look gorgeous hanging up in her bedroom. As you will notice looking through all of these pictures, I have a kind of vintage theme going on throughout. That's because the bedding I have already purchased is like this. You may look at the things I've put on the list and think they are really girly, but I am the only girl in my family. I'm the oldest out of them all, My brothers, Cousins, etc. They're all boys, and being the oldest I was always excited when there was a new arrival in the family - hoped for a girl, and was left feeling disappointed. So now I'm having a little girl of my own, I think there is definitely going to be quite a bit of pink involved.